H269 Armchairs by Jindrich Halabala, Czech Republic, circa 1940 Iconic form, newly upholstered in a natural cotton slub fabric with original bentwood arms and legs. 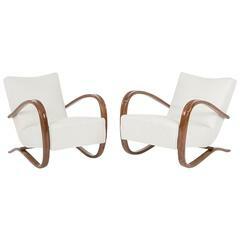 Pair of vinyl armchairs by G. Pulitzer Finali, Italy, circa 1940. Unique modern forms with shortened armrests in original vinyl upholstery and wooden legs. Knoll armchair by K. Antimott, Germany, circa 1950 Designed by Walter Knoll, and newly reupholstered in green cotton fabric by Titley & Marr. Armchairs by Guillerme & Chambron, France, circa 1950 Carved oak frame with original upholstered seat and back. 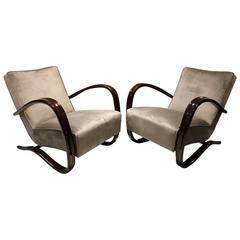 Beech bentwood armchairs by Thonet from the 1930s. Excellent restored with seat springs. Up to four pairs available Delivery time about 3-4 weeks. 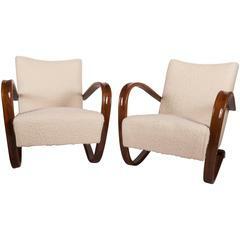 Beech bentwood armchairs by Thonet from the 1930s. Traditionally restored with seat springs. Up to 4 pairs available Delivery time about 3-6 weeks.